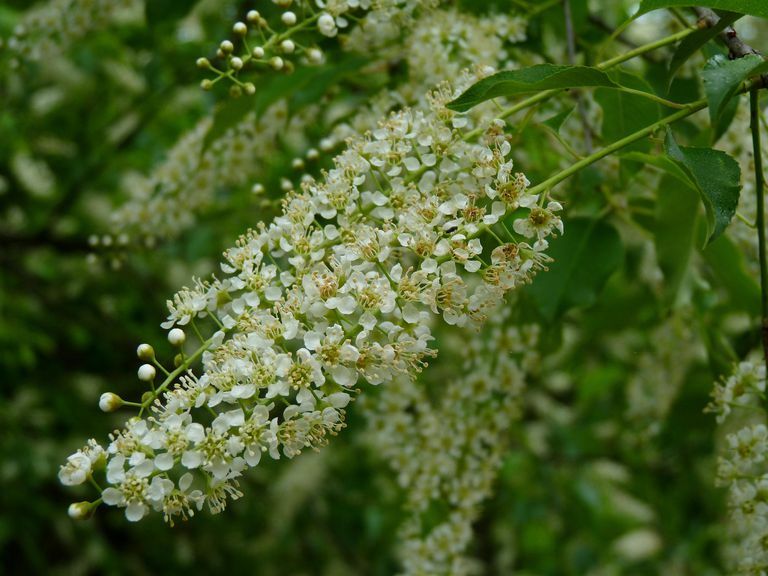 The black cherry or Prunus serotina is a species in the subgenus Padus with beautiful flower clusters, each separate flower attached by short equal stalks and called racemes. All cherries in the landscape or forest share this floral design and often used as specimens in yards and parks. All true cherries are deciduous trees and shed their leaves before winter dormancy. Prunus serotina, also commonly called wild black cherry, rum cherry, or mountain black cherry, is a woody plant species belonging to the genus Prunus. This cherry is native to eastern North America from southern Quebec and Ontario south to Texas and central Florida, with disjunct populations in Arizona and New Mexico, and in the mountains of Mexico and Guatemala. This North American native tree usually grows to 60' but can grow as tall as 145 feet on exceptional sites. The bark of young trees are smooth but become fissured and scaly as the tree's trunk enlarges with age. The leaves are alternate in rank, simple in shape, and narrowly oval, 4 inches long with finely toothed margins. Leaf texture is glabrous (smooth) and commonly with reddish hairs along the midrib beneath and near the base (see leaf anatomy). The flower's inflorescence (meaning the complete flower head of a plant including stems, stalks, bracts, and flowers) is very attractive. This flower head is five inches long at the end of leafy twigs of the Spring season, with numerous 1/3" white flowers with five petals. The fruits are berry-like, about 3/4" in diameter, and turn black purple when ripe. The actual seed in the berry is a single, black, ovoid stone. The common name black cherry is derived from the black color of the ripe fruits. The leaves, twigs, bark and seeds of black cherry produce a chemical called cyanogenic glycoside. Hydrogen cyanide is released when the living parts of plant material are chewed and eaten and are toxic to both human and animal. It has a very repulsive taste and that taste is one of the identifying factors of the tree. Most poisoning comes from livestock eating wilted leaves, which contain more of the toxin than fresh leaves but with a diminishing of the bad taste. 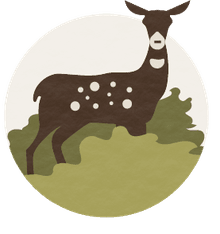 Interestingly enough, white-tailed deer browse seedlings and saplings without harm. The inner bark has highly concentrated forms of the chemical but was actually used ethnobotanically in much of the Appalachian states as a cough remedy, tonic, and sedative. The glycoside seems to reduce spasms in the smooth muscles lining bronchioles. Still, very large amounts of black cherry pose the theoretical risk of causing cyanide poisoning. The tree has narrow corky and light, horizontal lenticels. Lenticels in black cherry are one of many vertically raised pores in the stem of a woody plant that allows gas exchange between the atmosphere and the internal tissues on the bark of a young tree. The cherry bark breaks into thin dark "plates" and raised edges on older wood are described as "burnt cornflakes". You can safely taste the twig that has what has been described as a "bitter almond" taste. The cherry bark is dark grey but can be both smooth and scaly with reddish-brown inner bark.